Considering the many tips we’ve given, it isn’t like us to outsource our tips to others. Still, this article from Smartmoney.com does a pretty good job giving cigar novices a primer on selecting and purchasing cigars. Get hands on. A quality cigar will have a lustrous sheen and slightly oily texture, says McKee. It’ll feel firm between your fingers, and give off a strong aroma of tobacco. A cigar that’s been stored improperly, on the other hand, will be dull, with a dry, cracked wrapper. “It’ll crumble in your hand, just like a cracker,” she says. A bad cigar won’t have much of a scent. Stick to specialists. You’ll find an excellent selection of individually priced cigars at tobacconists and cigar shops, says Bettridge. 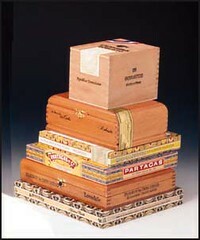 Look for a store with a walk-in humidor, which replicates the temperature and humidity of the cigars’ native country. Bonus: Because these stores sell only smokes, you’re more likely to find knowledgeable staff to make recommendations. Avoid buying online. There’s no way to know in advance if cigars have been stored properly, says Bettridge, or if you’re getting the real deal (counterfeit cigars — cheap, poor-quality tobacco dressed up with a ring band similar to a legit brand — abound). And even the most reputable online retailers sell cigars primarily in boxes — a costly proposition if you’re trying new brands. Go late. Unless you have a humidor, any cigar you buy as a gift (or to smoke yourself) should be smoked within a day or two of purchase. The exception: Cigars packaged in tubes. “They put them in the tubes when they’re freshly rolled,” Seise says, “so the moisture is locked in.” So long as you don’t open the tube, these cigars can be kept for a week or so. Beginners would also benefit from reading the article’s tips on origin, brand, size, shape, vintage, age, and color. While it is true that in the beginning noticing more complex flavors is difficult, it’s far from true that the flavors aren’t there. I would challenge the author to try a Carlos Toraño Exodus Gold or an Alonso Menendez and say that there aren’t chocolate flavors in cigars. For a better look at the often complex flavors in cigars, read this article on our Davidoff tasting. I'm not sure I would follow their advice with avoiding online purchases either. Reputable online dealers abound and the prices are sometimes half what a retail store might charge. Certainly some Drew Estate affiliated cigars you could find some hints of chocolate. In fact they have a line called Java with Rocky Patel. A good primer from a pretty decent publication. I'm glad you brought that up, and I agree wholeheartedly. I get the majority of my cigars through online purchases. While there's always a risk involved in buying items before you see them in person, I think that risk is relatively small — especially when you consider the benefits of shopping from home and excellent deals. Like Patrick A, I get the majority of my sticks from online retailers. Still, if you don’t have a humidor or only buy a handful of sticks a year, I think B & M (brick and mortar) stores are the way to go. You’ll get (usually very helpful) assistance to help you pick out your smokes and you only need to buy one at a time. After a while when you start to learn what you like, you should go online for better prices. I think with online sales there are two important things to do. 2) order small (like a five pack or two) until you trust them yourself. If the online vendor passes those tests… you're probably good to go. I have trouble going with the "Stick to Specialist". I've met way too many shop owners who are concerned with their bottom line and will tell you anything to get a sale out of you. I'd replace "Stick to Specialist" with joining a Cigar forum like Club Stogie, Cigarzilla.com or Stogietime.com or a blog like Stogie Guys and get an unbiased review over someone with another motive. I have to second Jerry's comment. While there certainly are good cigar shop owners out there, most of the ones I've run into have tried to push expensive humidors, lighters, and cutters on me when I just wanted to talk smokes. I realize they are in it to make money, but this is one quick way of ensuring that I won't be returning. I still prefer B&M stores to online shopping, however, because it makes it even more rewarding when you finally find a GOOD store. Gentlemen, this is a very informative wesite. I have learned quite a bit fro the short time I have been reading your articles. In the past I have tried cigars but was put off because of the low quality. From what I have been reading I shouldn’t have bought them at a supermarket. (Go ahead and laugh) I see the error of my ways and am willing to give cigars another try. Can you suggest a particular brand for a newbie like myself? I have read the above article, while very informative, it does not suggest a cigar to start off with. Any suggestions would be appreciated. I find it humorous that you suggest not buying cigars online yet have tinderbox.com & cubancrafters.com on your website. The guidelines on online purchases given above by Doug is spot on. I have been smoking cigarettes for a decade now and to tell you the truth, I haven’t warmed up to the idea of cigars. This article made me think otherwise and I am trying out cigars as I am writing this! Thank you! As they say, it is always better to burn away than fade away!